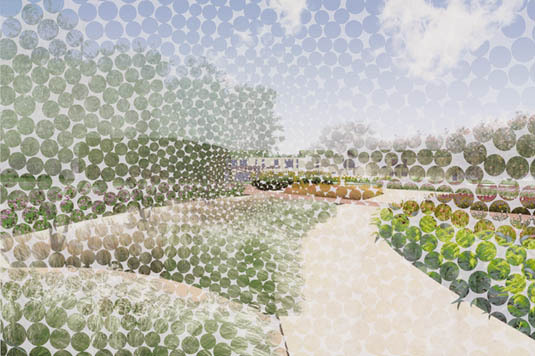 [Image: Untitled, Diana Balmori (2010), via Architect's Newspaper]. Nowhere is the divide between nature and culture, country and city, seemingly more stark than in New York City, where concrete, glass, and steel long ago tamped down the native flora and fauna of Manhattan. How can architecture and landscape architecture, themselves the product of the nature/culture divide, help mend this physical and philosophical rift? Balmori and Sanders recently co-edited the book Groundwork: Between Landscape and Architecture. There, in his introductory essay, Sanders writes that it is "imperative" today for "design professionals—architects and landscape architects—to join forces to create integrated designs to address ecological issues." However, he mourns, "longstanding disciplinary divisions frustrate this crucial endeavor." In part, Sanders looks back to the very idea of wilderness—that is, a pristine world separate from human activity—as a limit to discovering these "integrated" practices. In his words, "the idea of wilderness is so engrained in the American conscience—through literature, philosophy, and even notions of gender and sexuality—that it has effectively shaped the design approaches and even codes of professional conduct that in many ways still define the relationship between architecture and landscape practice." So how can this divide be overcome? What specific projects could we propose in order to demonstrate the "integrated designs" whose absence Sanders highlights? And if the remedy is not a design project at all but a more subtle, philosophical shift in how we think about—and even believe in the concept of—wilderness, what is the proper arena for definitive action? Sanders and Balmori will discuss these and other questions in the context of their ongoing collaboration for a new linear park system and proposed streetscape redesign here in New York City, which they will also present in an opening slideshow. As you'll see on Thursday evening, that project envisions a truly massive pedestrian park stretching the length of northern Broadway, and their pitch for it is not to be missed. I'm also thrilled to say that I will be moderating their discussion, bringing many themes and questions of my own and drawing, for instance, on the recent work of such figures as Emma Marris, Caroline Fraser, Janette Sadik-Khan, Liam Young, landscape anthropologist Clark Erickson, and others. The ensuing Q&A will thus range from future materials (such as robotic geotextiles) and controversial technologies (such as genetic modification) available to landscape architects; the legacies, both toxic and generous, of previous urban planning administrations; the incredible challenge of preemptive landscape design in the context of global climate change; and specific urban sites where ecological redesign is most clearly needed. You'll find more information, including how to buy tickets, over at the Museum of the City of New York website. I hope to see some of you there! by David Heymann that really get to some of what Landscape is really about; perception. He bases his essays on the work of Adolph Loos and to me as a practicing LA, Loos' ideas about landscape really get to the heart of the matter. Whether his attitude towards architecture has merit, i don't know. I'd love to see more on the intersection between landscape and architecture, it's a messy but rich vein to mine.